Rivalling the likes of Hyundai Verna and Honda City in the C segment, Linea gets a new 123bhp 1.4 litre T-Jet petrol engine making it the most powerful sedan in the segment. The diesel range draws power from the 1.3 litre Multijet engine pumping out 90bhp and petrol variants plonk a 1.4 litre Fire petrol engine making 87bhp. All these engines are mated to the five-speed manual transmission missing out on the auto-box. On the feature front, Linea sports a new 5-inch touchscreen infotainment system with Map my India navigation, Bluetooth, USB and AUX connectivity. It also comes with goodies including rear view camera, dual stage driver airbags, rear disc brakes and ambient lighting. Request a test drive for Linea in Tryaldrive. As we mentioned, we are glad about how Fiat has left the exterior almost untouched on the Linea Classic with the exception of a few features. At first glance, the Linea Classic looks like a regular Linea. There are no cues that suggest the missing bits and pieces. But maybe it is due to the fact that the only missing bits on the Linea Classic on the exterior front are the Alloy Wheels and the Fog Lamps. The Linea Classic still feels more expensive than it actually is. With a large satin silver grille flanked by two large dual-barreled headlamps, the Maserati references are quite obvious. Although the only hint of chrome on the Fiat Linea Classic is the large Fiat logo indented into the radiator grille and a thin chrome surround that envelopes the grille, the Linea still looks just as regal and mature as anything else in it’s segment. As we mentioned, the beautiful multispoke alloy wheels have been replaced by a set of 15 inch steel wheels adoring well-crafted wheel covers however, the Classic Plus variant does get the alloy wheels from the older Linea as standard spec. From the sides too, the Linea is just as before with it’s large proportions accentuated elegantly by the use of well-placed creases and muscular wheel arches making it look classy, especially in the right color. The interior is where the Linea starts to show a bit of age. The Linea Classic comes with a grey dashboard combined with beige accent pieces and seats. Although the dashboard looks pretty similar to the likes of the Linea T-Jet, there are a lot of features that have gone missing from the Linea Classic. For starters, the Classic gets a conventional knob type air-conditioning setup as compared to the climate control offered in the higher spec cars. The Classic Plus though does get the option of a Climate Control air conditioning system. The infotainment system also seems to have lost out in a big way in order to reduce costs. The ‘Blue and Me’ Bluetooth is the first thing that seems to have got the boot along with the provision for a USB or AUX input. In today’s day and age where the concept of using a CD is getting old-fashioned, the lack of a USB slot will definitely hurt the Linea Classic. The electronically adjusted rear view mirrors too have been ditched for a set of manually adjusted ones. This though seems to have been done in a bit of a hurry as the adjustment knobs are oddly placed. The Fiat Linea Classic has also lost out on steering mounted controls and gets a slightly reworked instrument binnacle. The seats too seem to have been reworked and are not as comfortable as we remember them being. On the plus side, the Linea does have a lot of space as compared to the rest of the offerings in a similar price range. The large dimensions of the Fiat Linea Classic become clearer when you pop open the boot. Ali Baba would feel right at home here. Gearshift quality is precise with a hint of notchiness and the long travel clutch is very lightly sprung. There’s quite a bit of lag till 2000rpm and the real rush only begins above 2300rpm before tapering off at about 4000rpm. It’s a vocal but rev-happy engine and can be fun as long as you’re willing to do a lot of work with the gearbox. Our test figures for the Linea indicate a 0-100kmph time of 15.6 seconds and a top speed of 169kmph. The diesel returns 14.9kmpl in city and 19.1kmpl on the highway for a combined efficiency of 15.9kmpl. The Linea was possibly one of the best balances between ride and handling in recent times and the new Fiat Linea Classic is no exception. The Linea boasts superb ride quality and is almost totally unaffected by the quality of the roads we have come to expect in India. Both low and high-speed comfort is equally good and it is this balance that makes the Linea so good to drive. Yes, the Linea does have a slightly firm suspension and you can feel a slight thud once in a while traversing over a pothole at speed but it can be forgiven for the way the Linea Classic handles the twisty bits. The Linea Classic is so well set up that the level of grip you get out of the Linea Classic border on incredible even while running on the smaller 15 inch wheels. Where one can expect other cars to wash off speed heading into a corner, the Linea grips endlessly. This is where the lack of power is more than obvious and where the likes of the Linea T-Jet score so well on drive pleasure. The increase of ground clearance too hasn’t taken a toll on the Linea’s drive characteristics. Check for low interest car loans on Fiat Linea at Fincarz. Fiat Linea On-Road Price in Mumbai ranges from 8,98,891 to 11,43,418 for variants Linea 1.4L Active Fire and Linea 1.4L Emotion respectively. Fiat Linea is available in 5 variants and 5 colours. Below are details of Fiat Linea variants price in Mumbai. 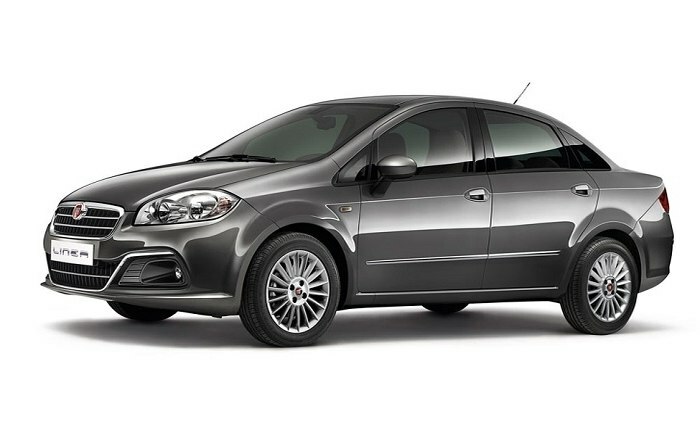 Check for Fiat Linea price in Mumbai at Carzprice. We cannot say this enough but the Linea Classic is beautiful. Possibly one of the most beautiful saloons India will see for a long long time to come considering recent trends in design. The Linea Classic also handles exceptionally well. Infact, it is better than all it’s similarly priced rivals here too. It is a tad low on power compared to it’s predecessors and is definitely far less equipped that its rivals. Going up against the likes of the Honda Amaze and the Swift Dzire might certainly be something that Fiat never intended to do but by placing the new Linea Classic in a similar price bracket they have done just that. On the whole, the Linea is an excellent value for money package if you are looking for a larger car that doesn’t cost as much as one would imagine. We also think that the new Fiat Linea Classic will do extremely well with the fleet operator segment and hotel owners looking to add a bit of class to their range. And with Fiat gearing up in a big way with over 100 showrooms by the end of this year, we foresee a drastic change in the way the general public perceive Fiats in general.